After drooling over the Mary Katranzou for Topshop collection and her recent LFW show, and with my recent hiatus on clothes shopping well-enforced, I was inspired to raid my closet and then Lauren's for anything print. The result was this stunning pairing that Lauren boldly wore out on our weekly "work was tough, let's imbibe" playdate--an all too frequent but none the less enjoyable occurrence. I'm not even a print fan. In fact, it's been like dragging a horse to water for Lauren to convince me to incorporate prints into my wardrobe. But this, this I can get behind because the metallic shine of the sharp-cut jacket against the soft graphics of the loose, flowing dress strikes a perfect chord...not to mention that hazy blue reflection of the evening sky reflected in the jacket's silver tiles. You guys look like you always are having so much fun! I am also not that big of a fan of prints also but the above pictures completly change my mind. love your jacket! Looks amazing! UH!!!! TOTALLLLLYYYYY jealous of the Alexander Mcqueen clutch!! 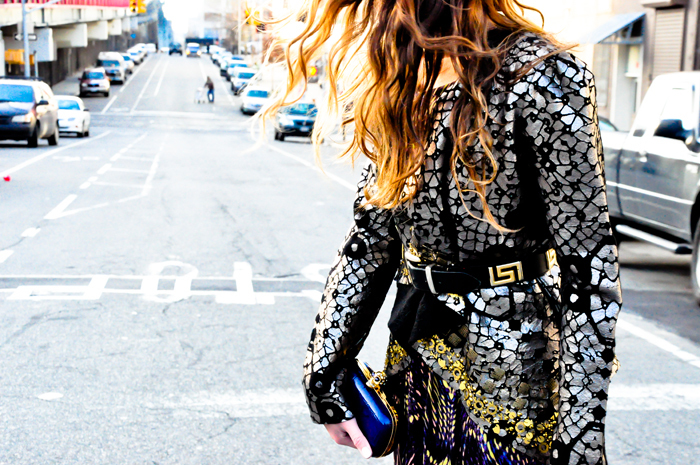 I love the mix of prints and the metallic on the jacket. It's such a fun look. Also loving the white nails. Holy metallic, you look amazing. Love this look! The dress and jacket are great together - and the post title is so fitting. Love the metallics. Frecking amazing. Wow!! this look is fantastic! Great metalic flair going on!! Congrats!! Thanks For The Comment Hun! Stay Tuned, As Will I.
oh myyy! Love this! Such an interesting combination of patterns!